Info "Aliens surrounding ship! SOS! Help!" 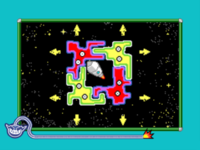 Space Trap is one of Dribble & Spitz's microgames in WarioWare: D.I.Y. Showcase. A rocket is stuck between four yellow and red strange-shaped pieces. The objective of the game is to click on the pieces that are possible to move at the moment. Each time, only one piece is able to be removed, and removing it allows to remove another piece. The player wins, if they remove all pieces, and free the rocket ship. This page was last edited on October 8, 2018, at 19:12.